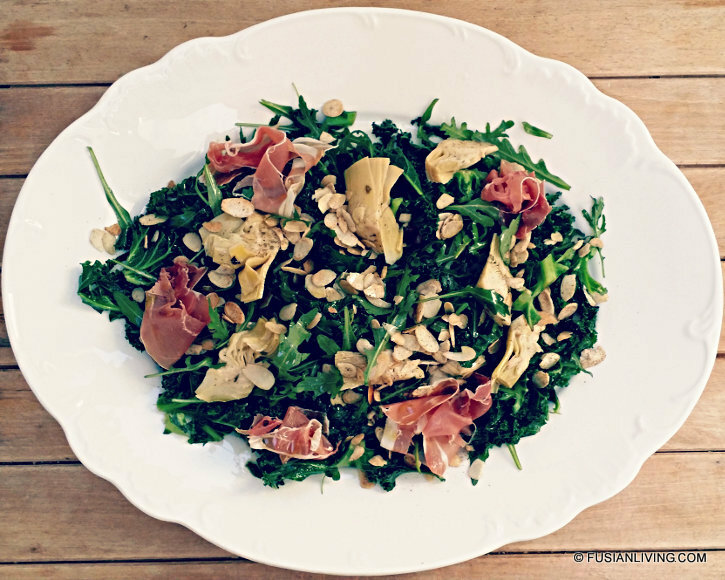 Warm Kale & Artichoke Salad with toasted almonds | Grow Your Own Veg Blog. Gardening and Food Blog. It is early spring and the days have just started to get warmer, but there is still a noticeable chill in the air. Today, I feel like a salad that is full of leafy green goodness that is warm, comforting and full of flavour and texture. And I have just the thing, for kale, pan-fried, is seriously tasty, and even more so, when combined with the bold saltiness of anchovies, flavourful artichokes and crunchy toasted flaked almonds. 1. In a frying pan over a moderate heat, dry fry flaked almonds with the five spice powder and pinch of sea salt, until lightly toasted. Remove and set aside. 2. Heat oil in the same pan, then add the kale and cook for 2-3 minutes, adding water (half a tablespoon at a time) to prevent it from burning. 3. Into a salad bowl, add dressing ingredients. Add cooked kale and rocket and toss though. Season with salt and pepper. 4. Arrange salad, artichokes and parma ham onto serving platter. Sprinkle over the almonds.